If 100% accurate this is even more amazing than before! Wow! Great job NVIDIA. I am excited just thinking about the mid and high end maxwell gpu’s. I’m affraid it’s too optimistic. We has the same measured, around ~75W per card for Gigabyte 750 Ti. BTW: We only can get 290 KH for the 6 card rig(TDP 65.5), also not stable(not sure is this caused by CudaMiner). @ jk_14: That includes an increase in power draw from all system components when mining. This will increase no matter what the card used. The author is measuring the *exact* draw from the card. The measurement above is only for the card, the watt meter is placed between the power supply and the powered extended measuring all the power that goes to the video card. This is the exact power consumed only by the video card with stock and with overclocked settings. When measuring the full system power draw with with card at idle state and when you start mining you cannot get adequate result only for the video card’s power consumption, because not only the card has increased power consumption, but the whole system has increased load – CPU, memory, motherboard etc. use more power as compared to when the system is in idle (power saving mode). Our goal was to measure the exact power usage of the GTC 750 Ti only, also if you are interested the idle power consumption of the card only is about 2-4W. Not sure what kind of cards you are running but I have 5 EVGA FTWs running at 305-315khs each, very stable as well. Try the T5X24 kernel setting or T10X24. Which motherboard do you use? do you use power in pci-e extenders? I have an EVGA version of this card. I have the GPU clock speed at +135 and the memory at +670 but can’t get over 301khs. I get the highest hash rate with T20x20. I’ve tried increasing the voltage but I can’t seem to get the memory clock rate much higher; and can’t get the hash rate higher at all. Is there anything I can do to squeeze anything else out of this? You used a powered PCIe riser, which is powered via a molex connector, right ? And from what I understand, you measured the draw from that molex connector ? If so, you are neglecting the power sent from the motherboard PCIe to the graphic card via the flat ribbon cable. That could explain your very optimistic result. nVidia would be the best competitor to Scrypt Asic if they could reach such a high KH/s per watt ! Mark, no, actually you are missing something… look at the picure above! We did not use powered PCI-E riser with ribbon cable, but a one that uses USB 3.0 cable and that one does not have any of the power pins connected to the motherboard… all of the power to the video card is supplied through the molex connector powering the extender. The USB 3.0 cable used is only for the data lanes. So this is the full actual power usage of the video card only. Are you sure that the USB 3.0 cable doesn’t drive a bit of power ? By design, it can bring 100 Watts, so the cable is no limiter to what to motherboard can send through its PCI Express ports. A motherboard can deliver power through PCIe even without additionnal molex. A way to concur your findings would be to measure the total power draw from a 6 x 750 Ti Scrypt rig. Hope you are right! Mark, if you are using a USB 3.0 cable as it is meant to be for a USB device you normally transfer 5V over it to power the device connected with the cable. This however is not the case with the use of the USB 3.0 cable here with the PCI-E risers, here it is solely used to transfer data – the PCI-E data lanes are routed through the cable all of the power goes to the card through the molex connector with the board where the PCI-E slot for the video card is located. The USB 3.0 cable is a convenient solution for longer distance as it is designed for high bandwidth transfers being shielded and all with enough data lines on compact design, unlike the ribbon cables that are used for the cheaper PCI-E extenders that do not allow for very long distance due to signal degradation. Thanks for the detailed information. As I said, I hope you are right, and you seems very confident that you are. I just don’t understand why every other person measuring their power draw with Kill-A-Watt and similar instrument find around 60W, and not 30-37W as you do. May it be possible that the reference card is more power-efficient than custom OEM design with additionnal PCIe 6 pin connector? Another question : did you measure the power consumption and hashrate in both PCIe 16x and PCIe 1x ? 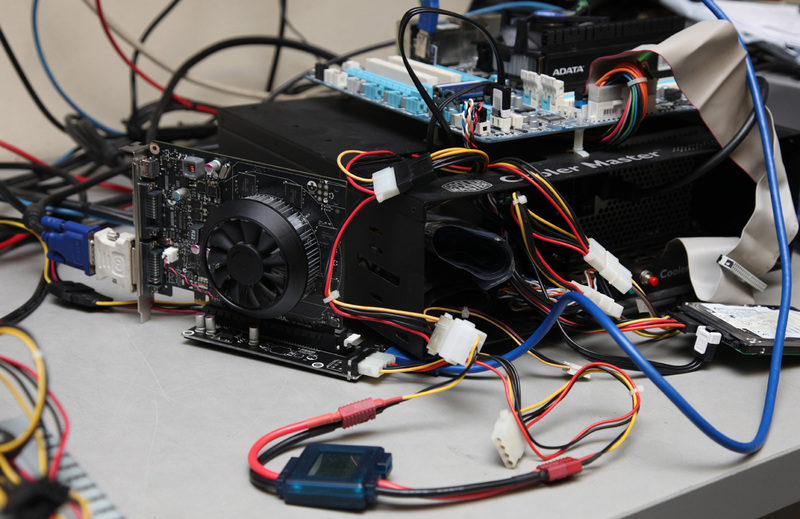 Kill-A-Watt measures the power at the power outlet of the whole system and measuring the system at idle and then with the video card mining and subtracting the numbers does not give you accurate results for the card consumption only (it also takes into account the efficiency of the PSU). When you start mining with the card it also increases the overall power consumption of the whole system (processor, motherboard, memory…), that is why you are getting around 60W and not more like 40W for example. Do have in mind that the Power Target limiter of these cards is set to 38.5W and that goes not only for the reference board, so the built-in power limiting functionality of the card will not allow it to go past this power consumption anyway… unless you modify the BIOS to increase the limit. It’s not a viable way to measure the power usage, your riser is giving power only to the 12Volt line, but you missing the 3.3V power (on pins 8-9-10) and those pins pass for the usb connector…by specific the 3.3V lines are rated to 3A, so there are at least other 10Watt of consumption. The board of the extender where you place the video card has a single AZ1084 voltage regulator that does take 12V input and outputs 3.3V in order to supply the video card with the required 3.3V along with the 12V power. There are no like extra up to 10W on top of what we have measured because of the 3.3V line, the power consumption of this line is included in what we have measured on the 12V input line. Well in that case since data lines power are negligible you are really measuring the effective power usage. By the way, the riser with the onboard 3.3V power regulator seems pretty nice, do you have a link to them? thanks, I’ll check those riser! I just bought a 750 Ti after reading this, and I would greatly appreciate you run more tests, I’m also in the group of “there’s no way”…. Just under 300kh/s per card, using pci-e x1 USB powered risers. No TDP BIOS mod at all. So assuming my PSU is 85% efficient (240V supply), 380W / 6 Cards * 0.85 = 54W of power per card. Not sure if these gigabyte cards have the power limit raised with the factory bios. 38.5W TDP makes sense if you account for some efficiency losses in the DC-DC power circuits on the card itself. Where did u get the watt meter from? What’s the name of it. I have been searching for one for couple weeks now. Anthony, it is a SKYRC Watt Meter. I have read that the use of the USB risers can have a negative effect on hash rates due to the fact that there are not enough lanes of data and that the asrock risers that use sata cables to transfer the data work better. Have you thought about doing any testing in this matter? Mantle, yes, there is a slight drop in performance when you use risers, but that not only covers USB cable risers, but any riser that is 1x and not a full 16x… the lower performance comes from the fact that you are not using 16 PCI-Lanes, but only a single one for data transfer. same motherboard, Corsair 750W Gold PSU, using cudaminer, however why is my power draw in the 600s? With my original Ultra power supply, I was drawing close to 700W. What kernel are you guys using?